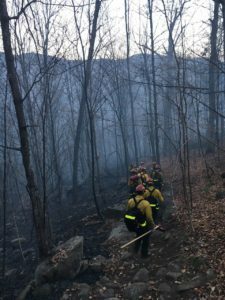 ALBANY – Over an inch of rain that fell Tuesday and Wednesday has aided the efforts of firefighters on the Covered Bridge Fire on the White Mountain National Forest. This brush fire, started near the covered bridge on November 12, has burned along the Swift River and west of the Big Brook drainage.About 329 acres have burned making this the largest fire in that section of the forest in a century. 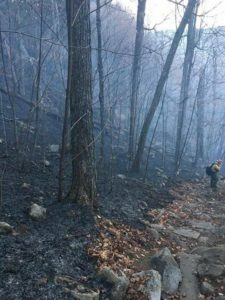 “We expect as of 6 today, the fire will be 100 percent contained,” stated Incident Commander Tony Davis. Containment means the fire is not moving beyond the constructed fire line but some branches remain burning in the interior. Crews will continue to mop up the hot spots and monitor the fire line for the next several days. No structures have been lost and currently no structures are being threatened. Passaconaway Road, Big Brook Road, and the Albany Covered Bridge remain closed. The Carroll County Sheriff’s Office expects Passaconaway Road to be open at around 6 p.m. today. 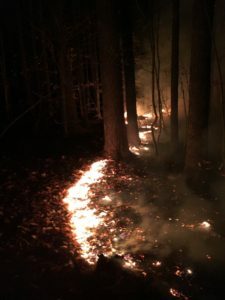 For public safety, the Forest continues to advise that people stay away from the area until the fire is considered controlled and completely out. It is still unclear how this fire started. Investigation remains open. If you have any information on the cause of the Covered Bridge Fire, please call the USFS Law Enforcement and Investigations at 603-447-5448 x129. Next Next post: Fire Towers in the news!